As a homeowner, one of the worst things that can happen to your home is having a rotting roof. Not only is it often expensive to repair, but it can also allow rain or snow to leak in through the ceiling and cause further damage to the interior of your house. Additionally, a rotten roof can lead to more serious complications such as mold or other toxic substances invading your home. If you have an emergency, call Nelson Contracting at (402) 464-2418. Fortunately, there are several foolproof ways to prevent roof rot and ensure your roof stays in tip top shape year round. Our Lincoln roofing contractors are dedicated to your home improvement, maintenance and problem prevention! While many factors contribute to the problem, roof rotting will always involve a high level of moisture collecting in various parts of your roof that go unnoticed. Over time, this moisture begins to spread throughout your roof, often leading to rotting shingles, which can weaken the integrity of the overall structure. The most effective way to prevent a roof from rotting is by working to reduce the amount of moisture your attic and roof collects. You can attack the problem from multiple angles. One of the easiest ways you can reduce the chance of roof rot is by investing in an effective ventilation system in your attic. Allowing air to move freely and circulate in your attic will help reduce the chance of moisture growing in any one particular area. If your attic is hot and stuffy and a little rain sneaks in, the dampness has no way of escaping the house and may begin to cause damage. Another effective way to prevent roof rot is by cleaning your gutters regularly. Because leaves and other wet debris often clog your gutters, these items can transfer moisture to other areas of your roof if not removed promptly. This is especially true of wet tree branches or sticks that could be already rotting from extended exposure to rain and other weather elements. Removing debris from valleys and skylights will also help to reduce the chance of a roofing ice dam. Taking a few minutes each weekend, or at least once a month, to clean your gutters goes a long way toward preventing a rotten roof. One of the best ways to reduce moisture collecting in your attic is by keeping the attic temperature consist throughout the year. Investing in a fan or other cooling system for the summer months may seem like a frivolous purchase if you only use the attic for storage, but it does an excellent job of preventing problems with your roof. Finally, you always want to take care of any issues you notice with your roof right away. 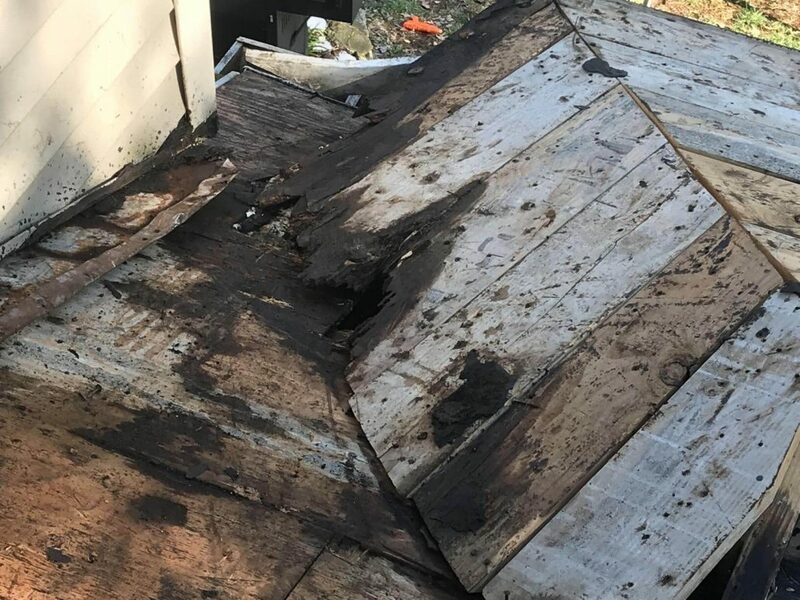 Even if the problem seems minor, calling a professional to quickly assess the damage can help prevent further issues with your roof, including rot. Speed really does matter when it comes to taking care of your home’s roof. Since your roof is such an important part of your home, ensuring it stays in great shape is crucial. While following the tips above are certainly helpful in reducing the chance of roof rot, having a certified expert inspect your roof at least once a year ensures that you’ll catch any risk factors before the problem gets out of hand. If you’re concerned your roof may be starting to rot, or you haven’t had your attic or roof inspected in quite some time, give us a call today at Nelson Contracting. We’ll be happy to send a member of our team to check out your roof and make recommendations for necessary repairs.